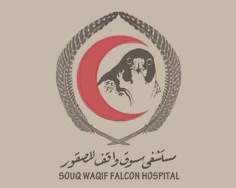 Surgical intervention on falcons is a routine procedure in SWFH and is accomplished with putting the falcon into sleep with different planes of anaesthesia using inhalant Isoflurane with oxygen. Both soft tissues and orthopaedic surgeries are common in falcons. Soft tissues surgeries include simple wound management of all types, common keel injuries to complex surgeries of propatagium and crop surgeries. Most of the injuries occur during training or when attacked by other falcons. Due to the special anatomical features of avian skin, they are highly prone to extensive devitalisation to early drying and necrosis. 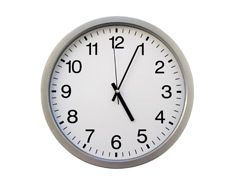 So every surgical procedure has to be performed in due time for a favourable recovery. Careful preparation of surgical site, selection of proper technique and using suitable materials are key factors to deal with soft tissue trauma cares. Post operative care of bandaging, feeding and medication is the major challenge ahead. 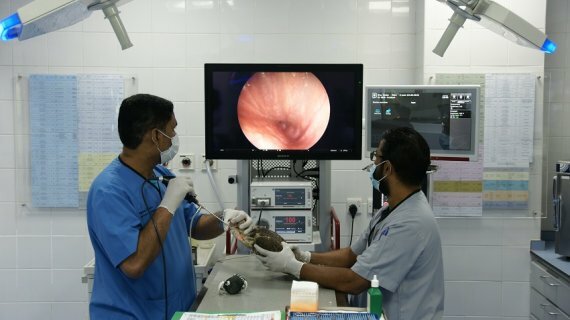 Special surgical techniques are also performed for example in dealing with sinusitis of infra orbital areas and removal of caseous and fibrotic from affected parts including lesion in choana and oropharynx. Other major surgical cases encountered are like dealing neck injuries, fresh and necrotic wound management in various part of body, removal of tumour or tumour like masses found during routine checkups. Other common cases like bumble foot, abscess in different body parts are dealt according the extent of damage and prognosis. Orthopaedic surgical intervention is required for dealing with the skeletal system. It is achieved either with invasive or with non invasive techniques. Both techniques aim to restore the mobility of the affected part. Assessment of all the surgical procedures is monitored with digital radiography. So that various stages such as stabilizing the fracture, anatomic alignment, assessment of stabilizing forces during the entire procedure. Non invasive techniques include special bandaging techniques and invasive technique is done with standard avian orthopaedic surgical method for fixation of fractured bones. The right choice of technique and therapeutic approaches are selected based on the fracture itself and the decision of the experienced veterinary team.